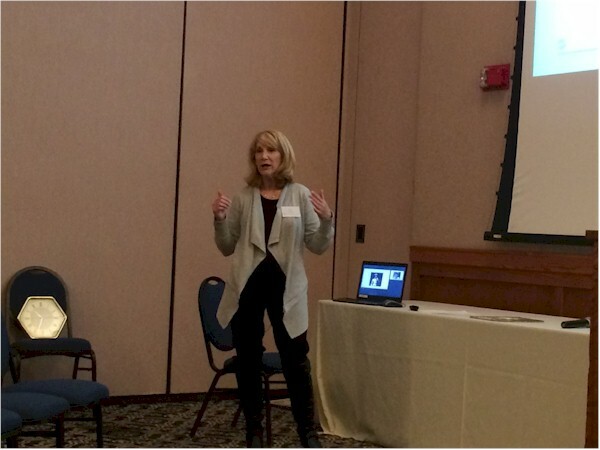 Jane Sutcliffe was my original reason for attending this year's Connecticut Children's Book Fair. Jane's a member of my writing group, and I've been acquainted with her for several years through the New England Society of Children's Book Writers and Illustrators. As things turned out, she was a morning presenter, and hers was the first author talk I attended. 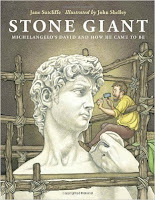 Jane talked about the original inspiration for her book Stone Giant: Michelangelo's David and How He Came to Be and how researching it led to another book, Leonardo's Monster. What was particularly interesting about Jane's presentation was her description of seeing the actual David statue in Venice and seeing in the face not just beauty, but a story. I thought Jane was not just talking about David or her books. She was also talking about how to look at art. Her description of what was going on in David's face and how it related to David's story was amazing and will have an impact on my thinking when I'm looking at art in the future. Speaking of David's story--I was certainly familiar with Michelangelos's statue, David. And I definitely know much of David's story...David and Goliath, King David, etc. I taught Sunday school for close to a decade and David is sort of the superhero of the Old Testament. I am embarrassed to say that I had not made the connection between the statue David and the Biblical David. Or if I had, it never hit me the way it did when Jane showed a close up of the statue's face and described what she saw in it and how it related to the story of David and Goliath. 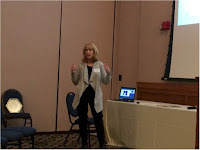 Jane Sutcliffe's Connecticut Children's Book Fair presentation would make a great offering at art museums with children's programs. I wonder if it couldn't be extended into an art history talk for schools, too. From one former Sunday School teacher to another, thank you for this post. Inspiration gained from looking into the face of art... I too have been moved to create after viewing someone else's creation. It is a font of inspiration. Thanks for this reminder, Gail! I teach at the National Gallery of Art (which has just started offering Writing Salons) and have seen Jane's book for sale in our shop--it's lovely. Oh, my gosh, Anamaria! It's at the National Gallery of Art's bookshop! That's the kind of thing I get excited for. Yeah, Leanne, supposedly creativity leads to creativity. Gail, I am so glad you came to my talk and even more pleased to learn what you took away from it. And I'm excited too to learn my book is in the National Gallery of Art's bookshop! Hurrah! I just saw this so a little late to comment. Sounds like it was a very successful event, well done Jane! I wish UI was in the US to see these events. Great to know that 'Stone Giant' is on sale at the National Gallery of Art! We've another collaboration "Will's Words" about to be released folks! We've been hearing about "Will's Words," and I'm looking forward to it.